As the only great ape species experiencing a population rise, the mountain gorilla’s recovery is an undeniable conservation success story. But the unprecedented growth poses a challenge for its habitat in the Virunga Mountains: can it sustain the future of this critically endangered species in a rapidly industrializing Africa? To help secure more safe space for the mountain gorilla, African Wildlife Foundation purchased 27.8 hectares adjacent to Volcanoes National Park in Rwanda and donated the parcel of land to the government. The first expansion to the protected area in over three decades, the donation helps Rwanda invest in its rich biodiversity and develop economic opportunities through tourism. Volcanoes National Park has been a priority landscape for species protection, with AWF's early conservation interventions helping to mitigate the threats facing mountain gorillas. Their populations were perilously low and fractured, with habitat encroachment and poaching driving numbers lower. Decades later, the mountain gorilla is the heart of Rwanda’s vibrant tourism industry. 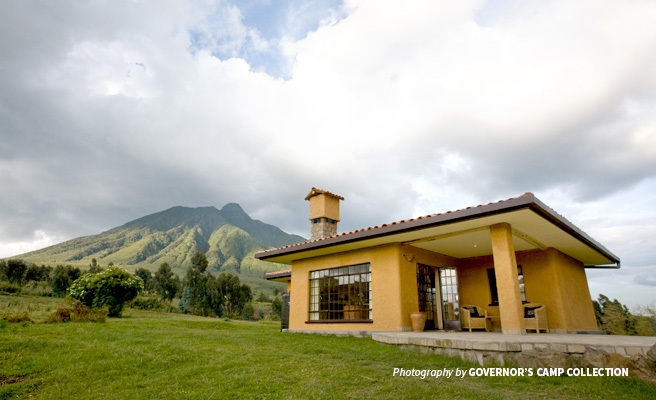 In 2007, AWF pioneered the development of an eco-tourism enterprise that facilitates local ownership with the establishment of the Sabyinyo Silverback Lodge. Built on the idea that protecting biodiversity must improve the lives of people and wildlife, this partnership between Sabyinyo Community Livelihoods Association and Governor’s Camp, a private operator, is transforming local livelihoods. Community members own the lodge and receive a proportion of the lodge’s revenues. So far, the trust has generated almost $2.9 million from the lodge over a 10-year period, using rentals and community fees to drive successful education, electrification, and enterprise initiatives for people living close to the park. Communities now have an incentive to protect the mountain gorilla and its habitat — instead of poaching and hunting the wildlife for quick gains; they are making conservation-friendly investments for generations to come. Importantly, local attitudes toward wildlife are also changing in spite of increased cases of human-wildlife conflict. In only three years, the reported incidences of wildlife raiding crops tripled in the buffer zones around Volcanoes National Park. Although elephant, buffalo, duiker, and other large mammals are responsible for some destruction and injury, the mountain gorilla pays dearly for increased interactions with local communities. 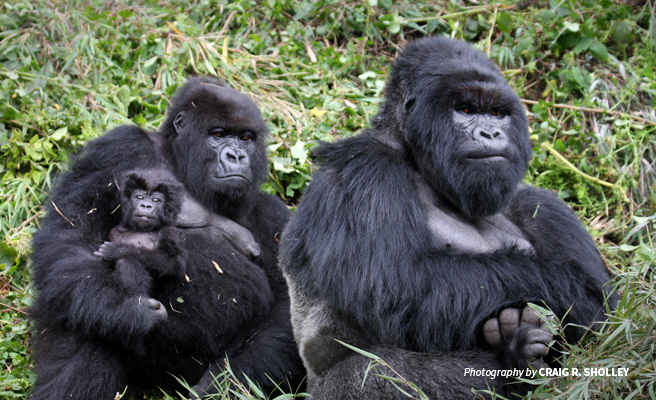 Respiratory disease caused by human viruses is increasing among gorilla groups. One outbreak is reported every year, making the need to expand safe habitats more urgent as populations growth continues. Although it only covers 160 square kilometers, the park is a national treasure attracting tourists from all over the world thanks to its unique gorilla treks — after hiking the misty mountains, one comes face-to-face with the silverbacks and their families. Foreigners require a $1,500 permit for this experience. Visitors to Volcanoes National Park have increased by 82 percent in the last decade, and revenues almost doubled between 2008 and 2016. In fact, Rwanda’s travel and tourism industry is among the top five fastest-growing on the continent. In the last two years, it has contributed over $400 million to the national economy — 10 percent of which is returned to communities. Rwanda’s revenue-share program is the most generous of any African country, cementing its status as a conservation trailblazer at a time when downsizing protected areas or reducing legal restrictions for human activity within and around them are common strategies for governments. 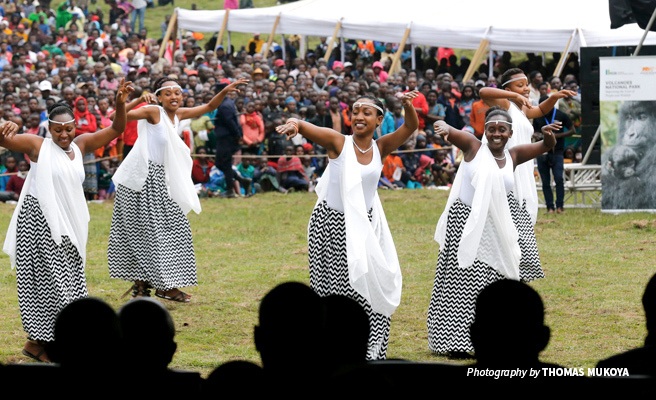 When AWF handed over the piece of land on January 10, 2018, nearly 2,000 people — including community members, conservationists, and country officials — gathered at the foothills of the Virunga Mountains in Kinigi to celebrate a dual victory for conservation. The gradual recovery of the mountain gorilla underlines Rwanda’s commitment to protecting its natural environment over the last few decades. With the historic expansion of Africa’s oldest national park, the nation signals an alternative future for the continent — one where it is possible to support a robust economy and maintain biodiversity. Kathleen Fitzgerald is AWF's Vice President, Programs East and Southern Africa. She works closely with staff to design and direct land and habitat conservation projects across the continent, including establishing community conservancies, securing wildlife corridors, and improving management of protected areas and community lands.